403G Decorated Live Ivy Birdcage Topiary Plant. Our birdcage ivy topiary with a wreath base is elegant and impressive. It’s also one of the most leafy of the topiaries in our birdcage topiary collection. We designed it that way because we wanted to offer a topiary that looked like it was designed for a table scape. You really get that with this birdcage ivy topiary. Are you planning a wedding or tea party in your backyard? If you are hosting an event of this nature – or any related event such as a baby shower, a bridal shower, a children’s garden party, or another elegant affair – then we have the perfect décor item for you. Not only are our live topiary plants gorgeous and green, but they are fully customizable for your big event. Best of all perhaps is how economical the live ivy topiary when you are facing a decorating budget for your event. Read on to learn more about how you can purchase multiple birdcage ivy topiary wreaths for your next big event. You’ll be impressing all of your guests with the simple beauty of these gorgeous plants. 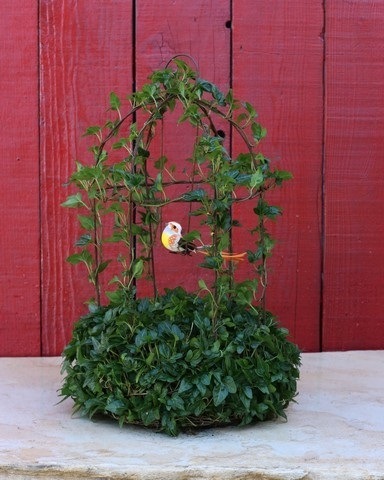 Our birdcage ivy topiary with a wreath base is elegant and impressive. It’s also one of the most leafy of the topiaries in our birdcage topiary collection. We designed it that way because we wanted to offer a topiary that looked like it was designed for a table scape. You really get that with this birdcage ivy topiary. The vines of the plant are formed into the birdcage frame design. The full green ivy leaves pop from the vines, cascading down the sides and pouring into a green ivy wreath at the base. You can customize this plant to fit your event décor needs. We’ve seen customers outfit this birdcage topiary with fresh hydrangeas and roses. We’ve seen it filled with fresh fruits. And of course, we ‘ve even seen it filled with whimsical, colorful faux birds. The wonderful thing about these topiaries is that the sky really is the limit when choosing décor to dress them up. They also are very economical when compared to a flower arrangement budget, so buy multiples and have them displayed on key tables throughout your event scape. With our birdcage ivy topiaries, you’ll only get admiration and compliments. Order yours today! Birdcage Ivy Topiary. Let soil approach dryness between watering. Do not let roots sit in water. Exposure: Bright, indirect light. Indoor Temp: 40 - 80 degrees F, Weight: 6.75 lb, Pot Size: M , Height: 18 inches. I am here to report that I love live topiary from this site.